The Eagle Nebula (Messier 16 or NGC 6611) is a young open cluster of stars in the constellation Serpens. 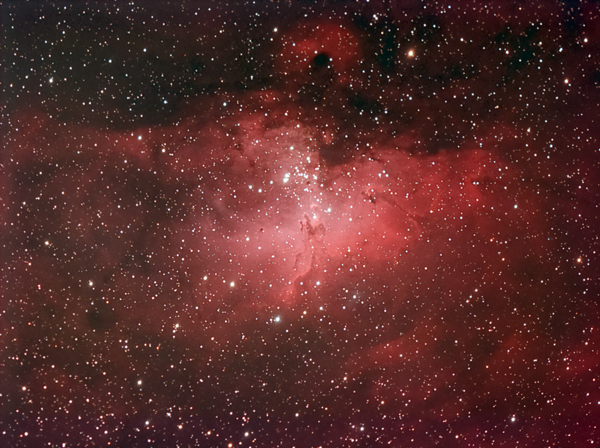 The Eagle Nebula is part of a diffuse emission nebula, catalogued as IC 4703. This region of active current star formation is about 6.500 light-years distant. The tower of gas that can be seen coming off the nebula is approximately 57 trillion miles (97 trillion km) high. "Pillars of Creation", depicts a large region of star formation. Its small dark areas are believed to be protostars. Calibration and stacking in Nebulosity 2, DDP and pre-processing in IP 3.75, curves and levels adjustments in CS3, noise reduction with Carbonis Actions, green cast reduction, masked high pass filter and color saturation with Match Color in CS3.